Sun Valley, ID AirBnB owners’ and vacation guests’ culinary offerings. Please scroll down below food display pictures for available overnight casserole breakfast menus and pricing. This Blog is for all of those here in the Sun Valley Area who wish to have Margot cater small BnB type food events. It also is for all those who own AirBnB vacation rentals as well as for their guests. Even though Margot Van Horn has lived in the Sun Valley area for over 35 years, from 2005 to 2010 Margot was an owner/ inn-keeper at her own Victorian B&B in Paso Robles, Ca. That is when she discovered how much she loved to cook as well as being a concierge. 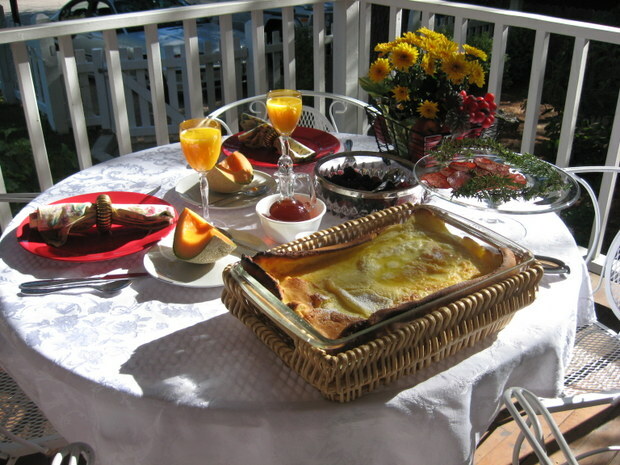 Listed below are some of the breakfast overnight casserole recipes her B&B guests loved. Margot thought that all of the vacation rental guests would also enjoy them. The overnight casseroles or other chosen menu option(s) will be put together by Margot in a discardable oven proof container. The dish will be placed in the Air BnB vacation rental’s refrigerator the night before the guest’s arrival or if they are already here, in the refrigerator any night that the guest wishes. The container will be accompanied with clearly written cooking directions (and the full recipe as well if so desired) so that it can easily be baked the next morning. Most of these dishes take less than one hour to bake and will enhance the vacation rental with a delicious aroma. Left over’s are still delicious and can be easily reheated in micro. 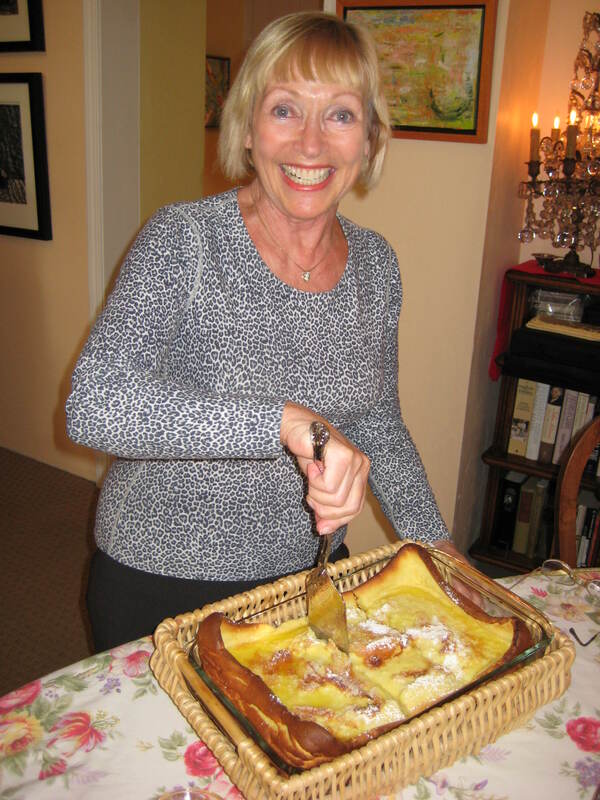 Margot has been busy catering small B&B type culinary get-to-gathers in the Sun Valley area since 2011 so aside from what is mentioned here on this food blog, she has many other menus available for appetizers, dinners, desserts and cookies. Many menus can be altered for vegetarian and restricted dietary requirements—just ask. For $50, Margot also will gladly shop and supply your BnB vacation rental with some staples before you arrive or even when you are here. The cost of the groceries is extra and a receipt of purchased items will be given to the client/guest. A few suggested staples might be: coffee, tea, milk, eggs, butter, fruit, bread, juice. Finnish Pancakes—-Melt butter in pre-heated 425 oven; when melted pour re-blended mixture into pan. Bake at 425 for 25-30 minutes or till puffy and golden. Overnight Scrambled Egg Bake with mushrooms and/or other veggies (Can be made with egg beaters) Bake in pre-heated 350 oven for 1 hour. Can be totally vegetarian or can add bits of ham, bacon,etc. Asperagus or zucchini Prosciutto Strata-–Bake in pre-heated 350 oven for 40-50 minutes. Huevos en Aguacate (eggs baked in avocado halves) When avocados are in season and ripe, this is a delicious easy- to- make dish—Bake in pre-heated 425 oven for 15-20 minutes. For special occasioned breakfasts, a Panettone Bread Pudding with Ameratto Sauce, Gingerbread Pudding and a Very Berry Bread Pudding are always wonderful tasting dishes to enjoy. Amazing and elagant breakfasts. Margot’s recipes are a gift! Thank you so very much John and Ingrid. Miss you guys!!! Hi Nancy, Thanks so much for your comment. I just made myself the Tostada for lunch yesterday. So easy and good. I love that little pan. Do you have one like it? We can book blog some on the Read It category on my blog if you want. That would be fun–and maybe we could get some more people interested in that. At my age, quality of must outweigh quantity! Your variety looks wonderful! Plenty of variety for the pallet! Anxious to try them out here in Palisade or in Sun Valley next Spring! At my point in life, quality has become more important than quantity in food consumption. No doubt your fare would satisfy the quality portion of the equation, and I look forward to trying them here in Palisade or in Sun Valley next Spring! Thanks so much for checking in. When you and Susan come visit next Spring, I will definitely do a bit of cooking for you both and hope that you’ll enjoy that. However, if before then, tell me if you try something from my blog and how you like it.